No power scaling. It's heavy! 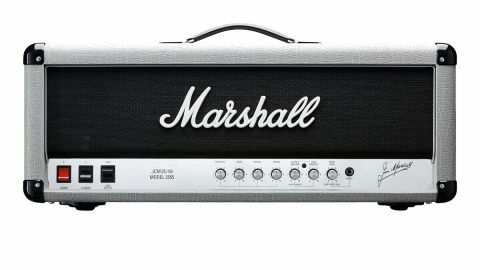 Way back in 1987, Marshall celebrated 25 years of production, and founder Jim Marshall celebrated 50 years in the music business, by releasing a unique limited- edition head called the 25/50 Silver Jubilee. Clad in silver vinyl, with an eye-catching chrome control panel, the 25/50 was only sold in its special finish during the anniversary year. Consequently, silver-vinyl originals are now very collectable. Marshall re-visited the 2555 again in 1996 for its first- ever signature amplifier, the 2555SL Slash, limited to just 3,000 units before once again disappearing from the catalogue. "Overall, the 2555X is built to last and look good for a long time, with Marshall's typically high build quality and attention to detail"
All of this just served to stoke the demand for 2555s even more - and it's never really faded. After months of rumour, Marshall finally announced a reissue of the original silver 2555, with the model designation 2555X, earlier this year. And here it is. The 2555X Silver Jubilee reissue has the same silver vinyl covering used on the originals, and looks just as handsome. The amp is made in the UK and built to regular UK specs, with a birch ply cabinet and a heavy-duty welded steel chassis. The chassis has to be heavy because it supports two enormous transformers, which are the main contributors to the 2555X's 22kg kerb weight. Externally, very little has changed - the carry handle end covers are now chrome, and Marshall has chosen to do away with the rear panel rotary switches used to select speaker impedance and input voltage. Instead, there are five speaker sockets wired to cover practically any combination of speaker enclosure, and the amps are permanently wired for the voltage of the country they're sold in. Inside the chassis, the electronics are mostly mounted on one large high-quality PCB, including all the valve bases. There isn't much in the way of wiring, but what there is has been neatly tied and routed in typical Marshall fashion. It's difficult to see how much of the layout has changed because the PCB is covered in black, but the infamous LED-based clipping circuit is certainly still there. The rest of the amp looks pleasingly familiar, with a simple front panel layout featuring controls for bass, mid, treble, presence, together with a preamp gain and two master volume controls - one for lead and one for rhythm. A push/pull switch on the output master volume changes channels, while another on the gain knob flips the 2555X into rhythm clip mode, changing the clean channel into something a lot more aggressive. The other item of note on the front panel is the third rocker switch, which changes the output stage mode from pentode to triode, dropping the power from 100 down to around 50 watts, and softening the attack a little. The sparse rear panel also features a series effects loop, a fixed-level frequency- compensated DI output, and a jack socket for a single-button footswitch, used to change channels. Overall, the 2555X is built to last and look good for a long time, with Marshall's typically high build quality and attention to detail. Apart from its association with Slash, Joe Bonamassa, and various other high-profile users, the main reason why 2555s are so sought after is their sound. Originals were darker and heavier than the contemporary JCM800, and generally more consistent from one unit to the next. The diode clipping circuit, which Marshall developed using a pair of LEDs, adds a big dose of very controllable distortion with greater harmonic depth. "We're pleased to report that the reissue amp is tonally as accurate as it possibly could be"
This made the 2555 everything that the JCM800 was trying hard to be, right out of the box. There was no need to plug in a stompbox for extra drive - the 2555 effectively had one built in - along with a dual mode clean/crunch rhythm channel and almost noise-free channel switching. We're pleased to report that the reissue amp is tonally as accurate as it possibly could be, with perhaps a touch more gain and low-end punch than the original. The overdrive channel will turn even the politest of Strats into a fire-breathing monster, but if you really want the Jubilee to sing, then a Les Paul with a good pair of PAF-style humbuckers or active pickups is the way to go. The clipped rhythm channel is equally powerful, while the clean channel is possibly a touch brighter, but without the foil-on-teeth fizz that some Marshalls from this era can produce. Just as the AFD Slash signature amp released in 2010 mimics the modified amps used on Appetite..., the 2555X absolutely nails the later classic GN' R sounds, although, unlike the AFD, it doesn't have the luxury of built-in power scaling and has to be cranked way up for the magic to fall into place. Even on the low-power setting, the 2555X is still ferociously loud; unless you regularly play outdoor festivals, it's unlikely you'll ever go beyond the halfway point on the volume controls without an attenuator. While the stack format may not be very practical for amateurs and weekend warriors, there are many who still choose to carry a 4x12 and head to gigs, and of course the stack will always have its place in the professional end of the market. The 2555X accurately reproduces the original tone - and with a few minor exceptions, the look - of the original, at a price that's very reasonable compared with the competition, especially for a UK-made product. Tonally, it doesn't quite have the massive bass response associated with today's modern rock and metal amps, but that genre reached saturation point years ago, and as a result, the Jubilee sounds just as fresh and relevant today as it did back in the heady days of 1987. As one of the most successful and coveted amps in Marshall's long and illustrious history, it was inevitable the 2555 would eventually be reissued - we're only surprised it's taken so long. Given the Silver Jubilee's significance for Marshall and the rock-guitar pantheon in general, we think the 2555X is likely to become one of Marshall's biggest sellers. Something to celebrate, indeed!